The GPCA egg oiling program has been successful. By limiting the number of goslings that hatch on our waters, the Canada Goose population has been kept within reason. Many neighbouring cottage areas have followed our lead and now have egg oiling programs in place. Finding the nests in the early spring and oiling the eggs in accordance with CWS regulations is only a small part of this program. Getting the Canadian Wildlife Service Permit is what makes the program possible. Canadian Wildlife Services (Environment Canada) issue the egg oiling permits. Even though the GPCA egg oiling program has been successful since 2004, the CWS Permits Officer does not want to give us a permit based on our membership list. The Townships of Severn and Georgian Bay and MNR are contacted annually for their support. In order to continue oiling eggs in our area, we must have permission from every landowner where nesting may occur. If you want the program to continue, we need help. It would be great if every land owner on the Pool and Little Lake would show support and we could present to the Canadian Wildlife Service a complete list of land owners in favour of egg oiling. Please keep this egg oiling program going by collecting the information from your neighbours. Pass around a sheet of paper as you would with a petition or do the contact personally. This statement followed by the printed name, signature, cottage address, and contact information for all your neighbours. If everyone works together, this can be done easily. Please collect the information and return the list to me by the closing of this cottage season. We will then submit the list with our permit application to Canadian Wildlife Services and hopefully obtain a permit for an egg oiling program for Spring of 2018. 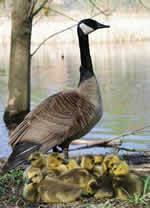 Environment Canada has issued new publications regarding Canada Geese and Canadian Wildlife Servive.